The HTML Document Object Model (DOM) is the browser's view of an HTML page as an object hierarchy, starting with the browser window itself and moving deeper into the page, including all of the elements on the page and their attributes. Below is a simplified version of the HTML DOM. As shown, the top-level object is window. 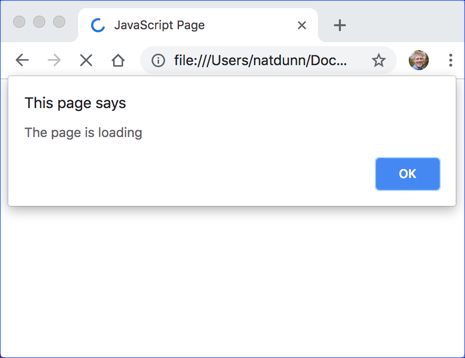 The document object is a child of window and all the objects (i.e., elements) that appear on the page (e.g., forms, links, images, tables, etc.) are descendants of the document object. These objects can have children of their own. For example, form objects generally have several child objects, including text boxes, radio buttons, and select menus. Single-line comments begin with a double slash (//). Multi-line comments begin with "/*" and end with "*/". Dot notation and square bracket notation are completely interchangeable. Dot notation is much more common; however, as we will see later in the course, there are times when it is more convenient to use square bracket notation. The window object is always the implicit top-level object and therefore does not have to be included in references to objects. For example, window.document.write() can be shortened to document.write(). Likewise, window.alert() can be shortened to just alert(). Note that, because window is the implicit top-level object, we could leave it off and just write alert("The page is loading"). And, in fact, this is the way it is usually done. The document object is a child of window, so we could write window.document.write('some text'), but again, window is implicit. Methods can take zero or more arguments separated by commas. 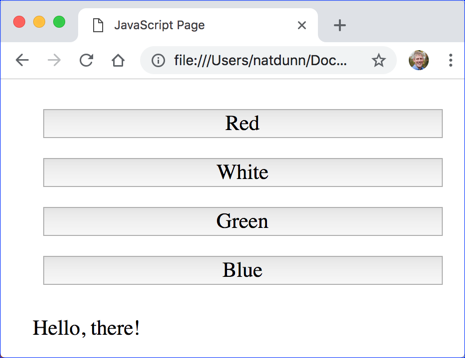 The alert() and write() methods shown in the example above each take only one argument: the message to show or the HTML to write out to the browser. 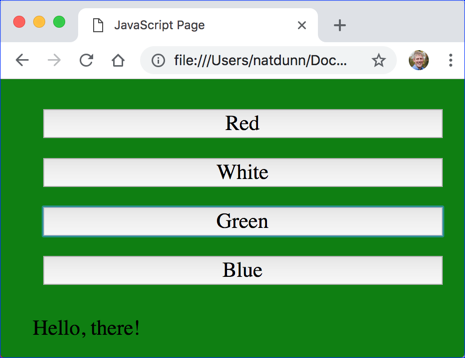 The body object is a property of the document object, the style object is a property of the body object, and backgroundColor is a read-write property of the style object. To understand what's going on, it can be useful to read the dot notation from right to left: "The backgroundColor style of the body of the document." Add click handlers to the two buttons to allow the user to change the background color of the page to red or to blue. In the head, we use window.alert() to generate the popup. We could have just used alert(). We use document.write() to write to the screen at the bottom of the page. We use onclick="document.body.style.backgroundColor = 'red'" and onclick="document.body.style.backgroundColor = 'blue'" to add click handlers to the buttons.